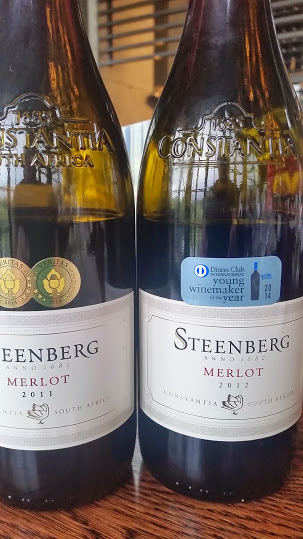 Steenberg winemaker JD Pretorius picked up double gold at Veritas for his Merlot 2011 earlier this year and then went on to win the Diners Club Young Winemaker of the Year for his Merlot 2012. Pretorius is overseeing a shift away from the wine’s traditional “peppermint crisp character” to something a bit more subtle, both the 2011 and 2012 marked by appealing lavender and rosemary characters. Tasting both vintages next to each other, I think the very good 2011 is exceeded, even if only slightly so, by the 2012 (both currently available). The former is certainly not “green” but shows more red fruit and doesn’t have quite the same composure (see previous review here). Matured for 14 months in barrel, 60% new. Black fruit, a subtle leafy quality and the start of some olivaceous character. Appealing notes of chocolate and spice from time in barrel. Carefully assembled – a good core of fruit and extraction well judged. Price: R140 a bottle.